Electromagnetic pollution is rampant in our industrialized word. Living, working and traveling in electrified environments and being directly exposed to active electrical appliances at home and the office bathes the body in electric charges. These affect normal physiology as the human organism has many measurable electromagnetic activities. Recently, a new medical condition, electric hypersensitivity syndrome (EHS) was coined to describe associated fatigue, facial irritation, tinnitus, dizziness, sleep disorders and digestive disturbances. 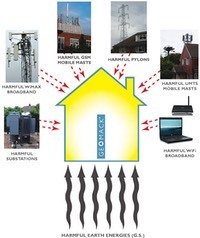 Besides man-made electromagnetic interferences, another natural source of “electrosmog” actually originates from the ground in the form of very low frequency (VLF) electromagnetic radiations. As underground water streams create friction against the bedrock, static electricity is generated and subsequently discharged in the form of VLF radiation (0.1-4Hz). German and Russian researchers found a correlation between the incidence of cancer and harmful earth radiation. Optimally, cancer patients should have their living environment tested for harmful geopathic stress and take corrective actions. A-D Research Foundation will be introducing a device to combat the problem of electrosmog.